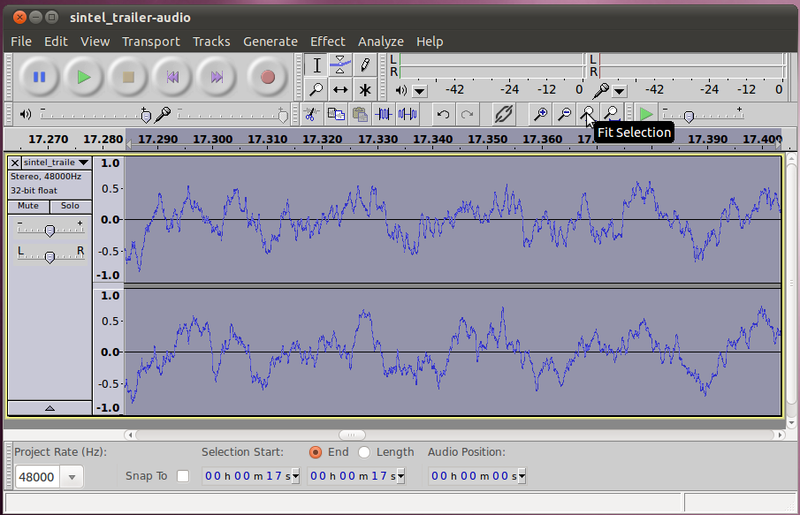 Audacity is a professional grade audio editor and recorder. It is relatively easy to get started with, but has many complicated and powerful features available to professionals. The first thing you need to start using audacity is some audio. 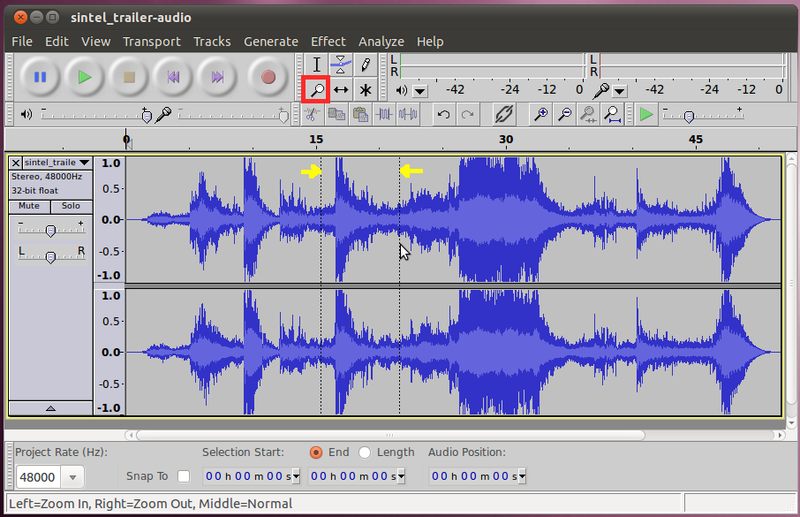 There are two ways to get audio into audacity, record it from a microphone (more on that in a bit) or import an existing track. 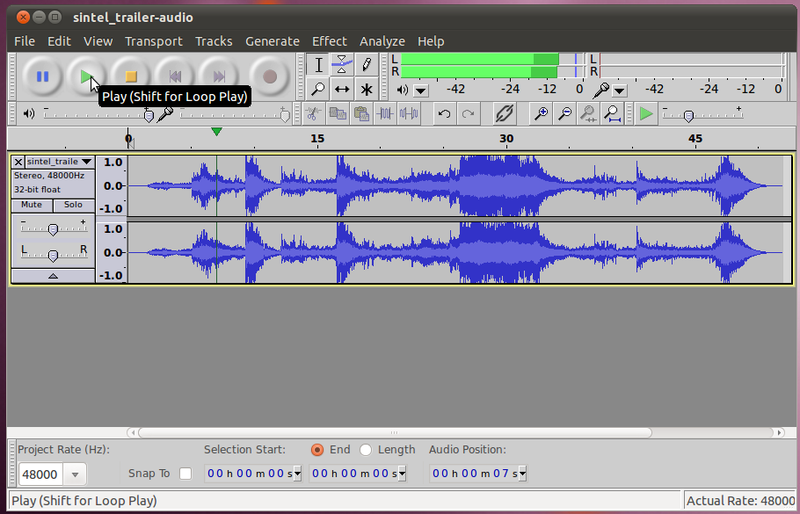 For now, lets use the import feature to get this FLAC encoded track into audacity. Once you've saved the file to the disk, open Audacity and select File -> Import -> Audio... and choose the file from your disk. 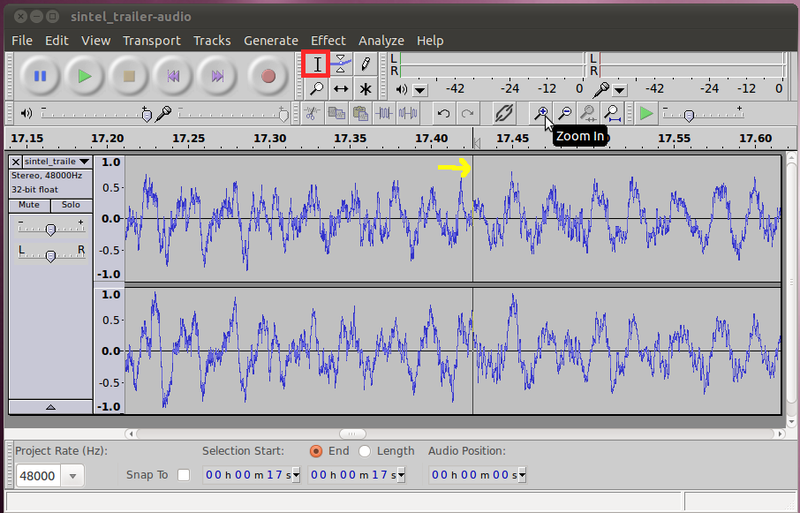 It will take a second to convert the file from FLAC to the native editing format (44.1kHz, 32-bit float), then you will see its "waveform" in the window. Once you have it open, you can play it back to hear what it sounds like. Just click the green play button, to start. The blue pause button to the left of the play button will halt the playback. The yellow stop button to the right of the play button will stop playback and re-set it to the beginning. You will see that the cursor moves along with the audio as it is played. Just under the play button is a slider that will let you control the volume of the playback. On the same line as the play button, but further to the right you will see two green bars (labeled L&R for Left and Right channels) which show the level of volume that is being played at that instant. If you want to understand better what exact part of a waveform you are working with (this will be very important when we get into editing), you will need the ability to zoom in on small parts of the track. There are several different ways to do this in audacity. The first is in selection mode (when the selection cursor icon is active, to the right of the record button). To zoom in selection mode click on the track at the spot that you want to zoom in (this will put a vertical line at that spot), then click the magnifying glass with the plus sign (+) on it until you are close enough. If you want, you can move the vertical line in between any of the zoom steps, or zoom back out (the button to the left of the zoom in button, with the minus sign on it), move it and zoom back in. Sometimes you have a particular section that is important, and want to zoom in to the point that the section of interest fills the screen. It might take several tries to get it just right by picking a spot, zooming in, updating the spot, etc. However, there is an easier way. To start we will use the selection tool to make a selection. Click the start of the section you are interested in and drag the cursor to the end of the section. As you move, the area you are selecting will be come darker gray, indicating that it is selected. Once you have the correct area selected, we simply click the "Fit Selection" button, which is immediately to the right of the zoom out button. You will then see that your selection takes up the whole screen. If you ever want to get back to seeing the whole project at the same time, you can click the "Fit Project" button, immediately to the right of the Fit Section button. The other way to zoom in and out is to use the zoom tool mode. You can enter this mode by clicking on the magnifying glass under the cursor button for the selection mode (just to the right of the record button). In this mode you can zoom in simply by clicking on a spot you want to see closer, and zoom out from a spot by left clicking. To zoom in on a particular selection, right click and drag across the section, you will see dotted lines for the beginning and end of the section. Unlike when in selection mode, this will not create a selection (dark gray) but simply zoom to that area. 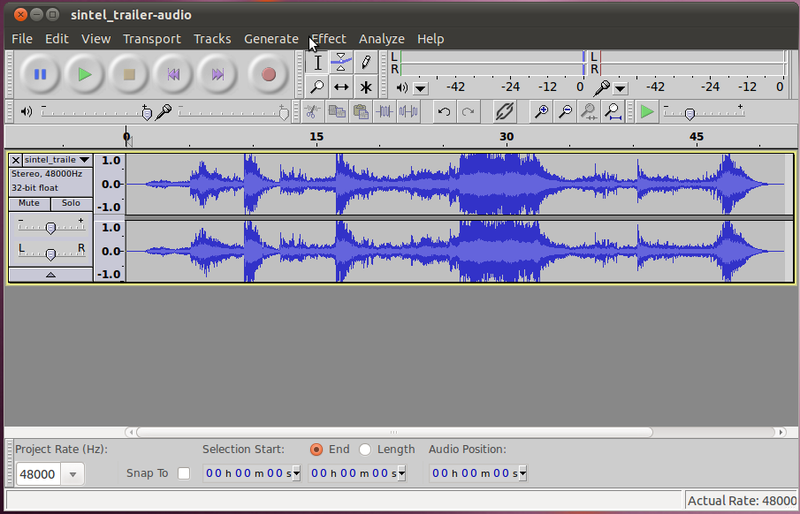 The other way to get audio into audacity is to record it. First, lets remove the track we imported previously. Just click the "X" in the upper left corner of the track's window. 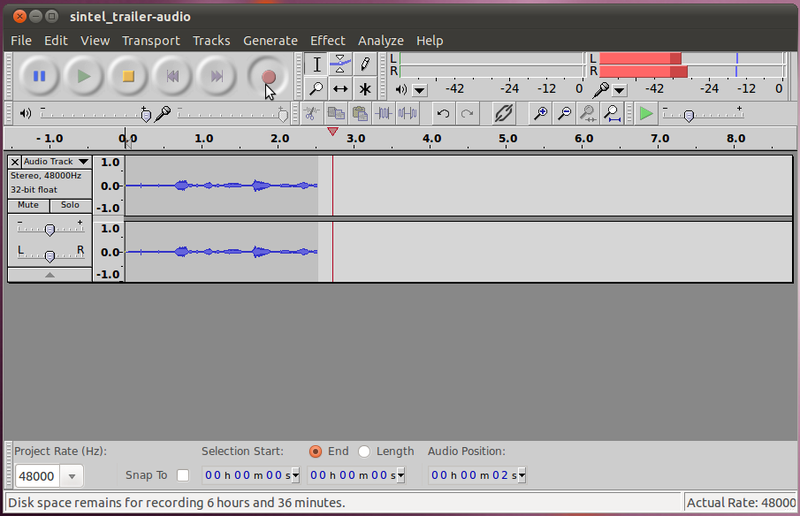 Now you should have a blank audacity window to record into. When you are ready, push the record button then start talking into your microphone. This time you will see the cursor be a bit ahead of the graph showing the waveform. That is because it takes the computer a short amount of time to process the audio it is recording and display it. Be aware that the location of the cursor is where you are at in the timeline, not where the graph of the waveform is showing up. You will also notice that there are two bars (red this time) to the right of where the volume was displayed during playback. This shows the level of volume of the audio being recorded at that instant. Finally, there is a slider under the record button that allows you to change the strength that the microphone records at. Unfortunately if you are running Ubuntu, this won't work. Instead, set this in the operating system's (not Audacity) Sound Preferences on the Input tab. Now that we have the start of an audio project we will want to work with, we need to save the project so we can open it later. To save the entire project, go to File -> Save Project As... When you pick a file name with the .aup extension, audacity will automatically create a directory (aka folder) at the same location as the .aup file, with the same name as what is before the .aup. This directory contains the actual audio data so it is very important. Do not delete this while trying to cleanup a directory. If you move the .aup file to a different location, you need to move this directory as well. At this point we could go on editing our project, adding more audio, etc. During this process we would be continuously saving the .aup file (in case our computer crashes). In the end though, we want to get our final result back out in a format that we can listen to (WAV, FLAC, OGG-Vorbis, MP3, etc). 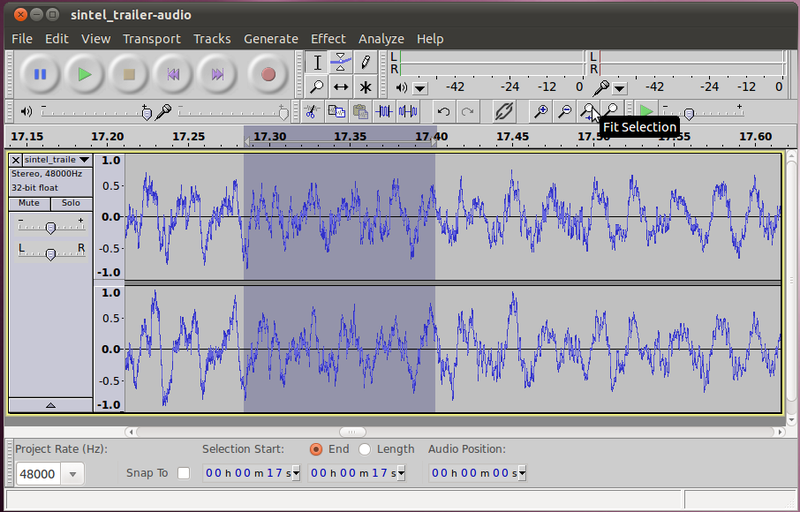 Unfortunately, AUP files are not something that you can listen to in a media player, they are a special audacity format (similar to XCF files for the GIMP). To create the more normal file types, we will use the "Export" function. Go to File -> Export and select the type of file you would like from the drop down on the bottom (FLAC is the recommended format), then enter a file name and click "Save".